¶ I am always in the market to buy BPOE (Benevolent Protective Order of Elks, or Elks Club) chips, both for inventory for this page, and for my singles collection. You'll know what lodge numbers I DON'T HAVE by going to this page , which lists the lodges I HAVE BPOE chips from. Also on that page you will find links to BPOE Lodge Locators -- a search engine and lists of BPOE lodges in numerical order, so you will be able to ID your BPOE chips as to the town and state of any BPOE numbered chip. ¶ The table below lists all of my BPOE duplicates, which are all for sale. ¶ The lodge number, town and state are indicated in columns 1 and 4. ¶ If I bothered to take a scan (100 x 100 pixls) of the chip, it is in column 2. 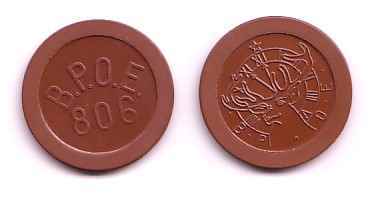 The crest and seal chips generally have a picture of an elk head on the reverse side. Every chip in this list, whether crest and seal or not, has "BPOE" and/or an Elk head on one or more sides, thus "proving" it is a BPOE chip. None have a mere number and a dealer's "word" that it is BPOE. ¶ In column 3, I indicate whether the chip is hot-stamped (hs) or crest and seal (C&S). ¶ The sales price per chip is in column 5. 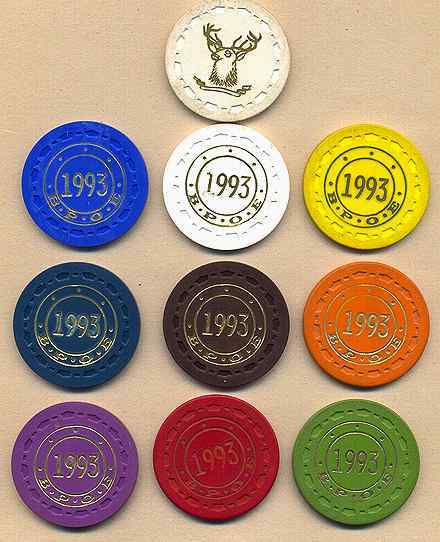 ¶ Everything else important is in column 4: city and state of the lodge; the colors/denominations of the chip I have for sale (if different or in addition to the one pictured); the condition if it is other than fine-OK-normal average use; the rim mold design; etc. ¶ ORDERING INFORMATION: click the link at the top of this page -- basically, it is a flat $3.00 for postage-insurance. Return privileges. PayPal is OK if not funded by credit cards. location, colors for sale, condition if not fine-average-OK, mold, etc. 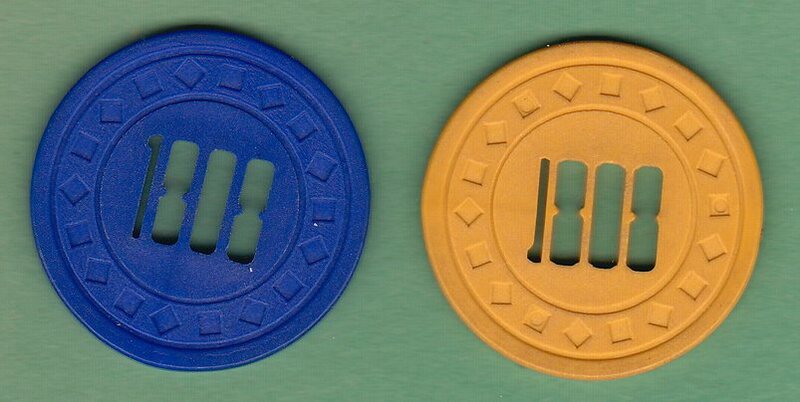 ¶ unusual chip -- for sale: blue (with inlaid "100" on reverse side); and red (with inlaid "50" on the reverse)! ¶ Click here for large picture of both sides of the chip. ¶ red ("$5" on one side), green ("$10" on one side)-- excellent condition. ¶ B-diamond rim mold design. Click here to see more about that relatively rare rim mold design. ¶ have chips in white (10 cents on reverse side of chip), green ($1.00 on reverse side), and yellow ($5.00 on reverse side)(the yellow $5 one is SOLD).......shipped 1927 to W.H. Goegee Co., Los Angeles. The lodge building is at 607 S. Western Ave, Los Angeles. .... .........note: scan is poor; condition is mint. ¶ $20.00 per chip, except the 10¢-white one is $10.00. ¶ I have just one chip -- a mere cheap green $1 plastic one. ¶ excellent -- very attractive unused chip. ¶ flower mold, blue, "BPOE 230" on one side; Elk head picture on reverse. ¶ excellent -- only 2 chips left. ¶ light gray, hat and cane mold, "BPOE 255" on one side, "100" on reverse. ¶ "266" on one side; picture of elk head on reverse. ¶ hot-stamped plain clay chip (no mold). ¶ I have/had about 6 of them, all: hot-stamped, different colors, square-in-circle mold. Half have edge spots. I'll send you the best chip I have. ¶ I have one yellow plastic chip from this lodge -- $4.00. ¶ red (fine condition) $25.00; yellow (slight edge burn on one side) $20.00; and yellow (burns on both sides) $10.00 . ¶ note: this chip is cited and pictured in the Herz' USPC record book -- it was made in 1926! ¶ metal (aluminum-like) interlocking (ray mold) chips. ; engraved. ¶ I also have hat-and-cane (Paulson) mold chips in white that have "359" on both sides (no BPOE or Elk head). These must be BPOE chips as they came with other chips that are marked "BPOE." ¶ rectangle mold (dashes, I call it). 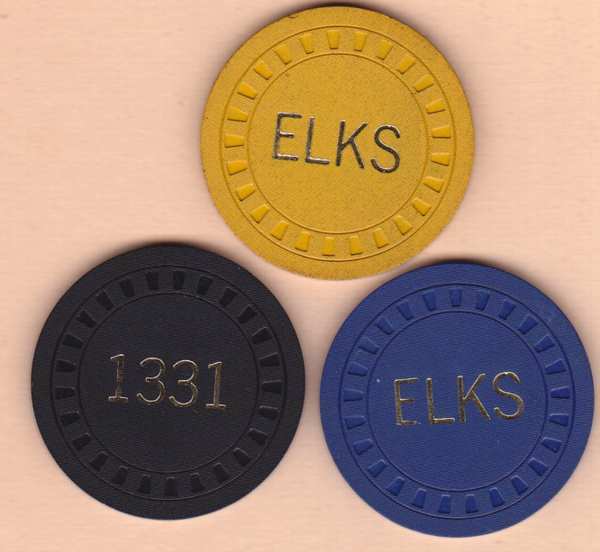 ¶ unusual in that a large "365" is on one side, and a large word "ELK" is on the reverse. ¶ triangle mold, 495 on one side, picture of elk on reverse. ¶ white plastic: thick square-edged plastic, uses Mold Design #35: 16 SUITS -- spade, heart, club and diamond, repeated four times. ¶ metal: red, white and blue. Click here to see picture of the metal chips. 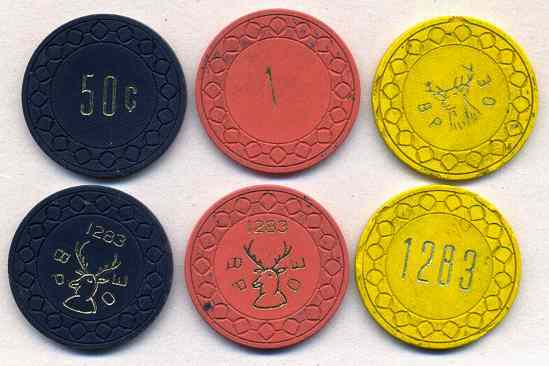 ¶ I also have 2 plastic chips from the lodge, red and white. $4.00 each. ¶ nicks, used, poor shape, but the side with the lodge number is OK, attractive. ¶ blue, triangle mold design -- 576 on one side, elk head on reverse. ¶ The yellow one is awful (and it is warped badly). ¶ only one chip left: fine crack (looks like scratch) near edge; looks OK for the most part. ¶ brown -- wonderful, unusual embossed chip. Click to see. 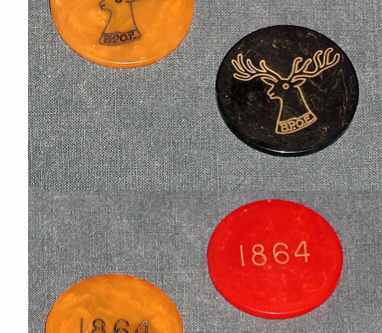 ¶ rare, but two problems: (1) cracked and glued; and (2) has "854 on both sides -- that's it --no Elk Head, no "bpoe" or "elks" inscription. Usually I would be skeptical of chips with just a number on them, for usually there is no sure way of knowing they are BPOE's; the number could just be a street number. But in this case I firmly believe they are BPOE's as the seller comes from Greenwood MS and he has sold the standard BPOE crest and seals from lodge 854. ¶ says "50¢ in trade." ¶ diamond mold: black, very worn hot-stamp, hard to read, $5.00 each. ¶ nice chip, hub mold, I have only this one brown chip. ¶ reverse side has picture of cowgirl and "visit historic Greenville, Ohio .. ... ... last week in July." 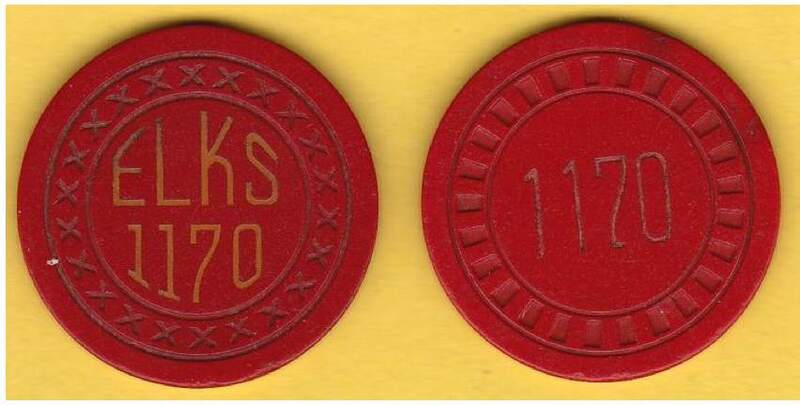 ¶ red, x-mold, used but OK condition, "Elks 1170" on both sides. ¶ red, hub mold, worn, "1170" on both sides. (I obtained both chips together). ¶ Click here for picture of both chips. ¶ some small burns; otherwise very nice. ¶ condition (both molds): awful: very used, burns, faded, dried out! ¶ nice condition, but no paint in the shallow hot-stamp impressions! ¶ 10¢, red, horse-head-right mold. ¶ OK used chip, but gold leaf hot-stamp is quite worn, it helps to tilt the chip to see the inscription. "BPOE 1248" is on one side; "10¢" is on the reverse. ¶ click here to view the chip. Note: I scored the faces with a pencil to highlight the inscriptions. ¶ 3 different chips --black/50¢/mint; orange/1/used; and yellow/no denomination/worn. Plus I have a green 25¢ one for sale (not pictured). ¶ Click here to view the chips. 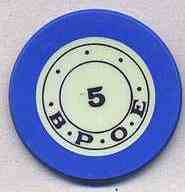 ¶ blue (1316 on one side; BPOE Elk-Clock logo on reverse). ¶ quality vintage plastic -- square-edged, thick, recessed Greek Key mold. 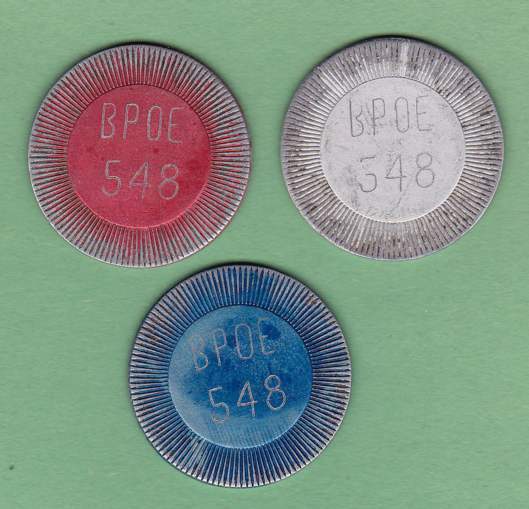 ¶ "BPOE" is on one side; "1331" is on the reverse. Hub mold. Excellent condition. ¶ Click here for picture of the chips. ¶ reverse side says "1950 State Convention, Corvallis, ORE."
¶ red; hub mold -- just this one chip. ¶ condition: very mangy: used, burns, soiled. ¶ BPOE 1573 on one side; a 5-pointed star on the reverse. ¶ horse head right mold. ¶ small key mold, white, nice condition. ¶ the reverse side has "$5.00" inscribed. All sides in excellent condition, except on the $5.00 side someone scratched "1604" with a fine stylus. Both sides seen by clicking here. ¶ used, but pretty chip and easily cleaned. ¶ cheap plastic, very flimsy, I have one red for sale. ¶ bigger picture: click here. ¶ superb chip: it is Borland's "lost" mold #22 ("tumbling squares"), just recently discovered. No BPOE #1808 chips were known till recemtly! The design is extremely unusual: the "1808" is perforated through the chip! You must own one of these! 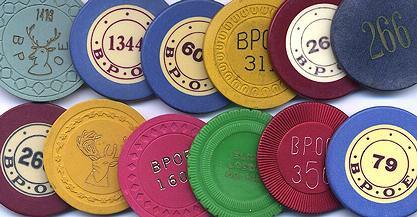 ¶ ***wonderful, unusual poker chips. Click here to see picture. ¶ have just a few chips: green. ¶ square in circle mold (brown), and Paulson hat and cane mold (green). ¶ very worn and edge nicks. ¶ red, white, blue, yellow, light green, dark green, brown, purple, orange -- generally, I have just one chip of each color. Click to see picture of them (some may be sold by now). ¶ one chip, diamond and square mold, red w/ 3 green edge sports, no denomination- used, worn some. ¶ 50¢ on the reverse side.